DETROIT, Mich. — After adding two on the women’s side Tuesday (06/26), Coach LaCema Womack bolstered the 2012-13 men’s roster with the signing of junior college transfer, Franz Beauregard. Beauregard, a 5’10” sprinter/mid-distance runner, comes to Marygrove after spending two years on Macomb Community College’s track & field squad. In high school, Beauregard participated in track for two seasons as a Huskie at Lakeview High School. The well-rounded student-athlete also played basketball during his days at Lakeview. 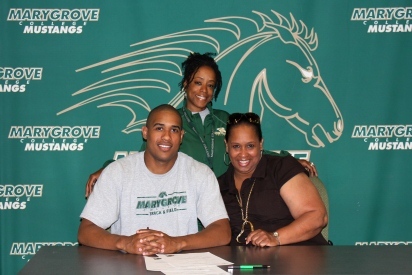 At Marygrove, Beauregard will be active year-round in the Mustangs cross country and track & field programs. Both programs are poised for breakout seasons for the Mustangs. Coach Womack on Beauregard: Franz brings versatility to our men’s programs with his sprint and mid-distance experience. Coming from Macomb Community College, Franz was able to gain college-level experience that will help our cross country and track & field teams. I look forward to coaching him in both programs.